The new version 7.0 of AV Voice Changer Software Diamond has a Virtual Audio Driver (AVnex Virtual Audio Device) which works as a virtual audio & sound device. This device can be used with any VoIP, Instant Messenging applications, or online voice chatting or web conferencing websites for changing voice and/or recording in real-time. By setting AVnex Virtual Audio Device as default audio driver for microphone in those applications, you will be able to control your voice tone and speak the way you want. 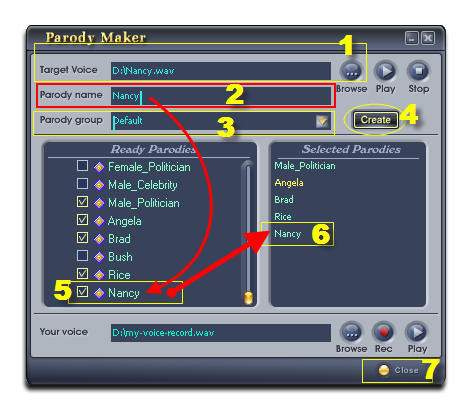 In this tutorial, we will guide you through how to use Parody Maker of AV Voice Changer Software Diamond (VCSD). 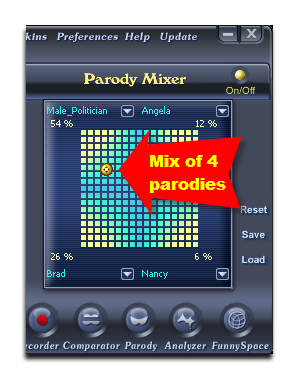 - If you want to use Parody Mixer to mix different voices together to create a new parody, you first need to record your voice with Parody Maker. - On main panel, click on Parody module to open Parody Maker. - In the Your voice section, click the Record button (1) and start speaking to your microphone, click the Record button again to stop recording, fill in the file name and click Save to finish your voice recording. You can play back your recorded voice by clicking on the Play button. - Speak a short and simple sentence of about five to eight seconds. During the recording process, keep your voice clear and natural. - If you already have a record of you voice, click the Browse button (2) to choose it. The recorded file must be a mono audio file (stereo file won't be added) and the record file must be *.wav format. 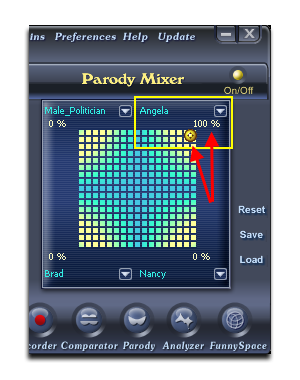 As you have finished recording, you can start using the Parody Maker right away. Click the Close button to close the Parody Maker and go to step 3 for this. 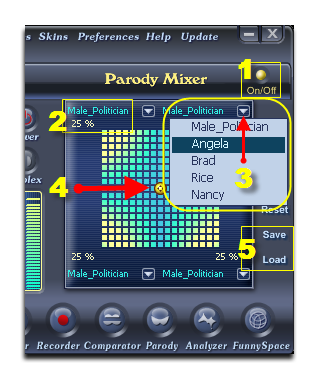 But if you want to specify the four input voices for Parody Mixer, go to the next step. (1) In the Target voice pane, click the Browse button to specify a recorded voice. The path of the file will appear at the Target Voice field. Use the Play and Stop buttons to pre-listen to the voice you have just added. Create a new parody group by typing directly into the Parody group field. (4) Click the Create button to create the new parody group and/or add the new parody into the specified group. The new item (5) will be added at the end of the Ready Parodies Tree. All selected parody voices (ones that have a check before it in the Ready Parodies list) will appear in the Selected Parodies pane on the right (6). (1) Turn on Parody Mixer. (2) The number under the input voice name displays the similarity percentage between the output voice and the parody voice. 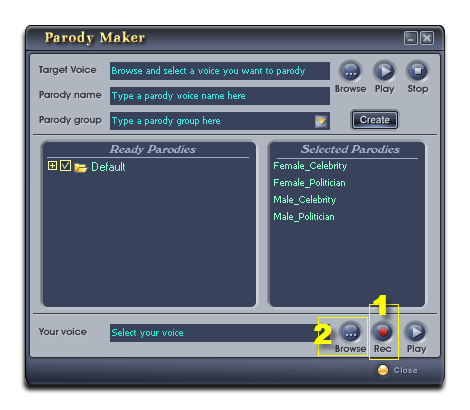 (3) Click on the arrow button to show the list of parodies which can be selected as an input voice. Do the same for the other 4 parodies at 4 corners of the graph. (4) The Parody Cursor. By moving it, you can control the mixing percentage of the four voices. moving this pointer toward an input voice makes the output more similar to that voice. (5) Click Save to save your mixing as a new parody voice for later use. - You can use the Parody features with the Pitch and Timbre graph and the Advanced Tune consentaneously. Combining them will help you have the best output voice. » Learn how to use the Pitch and Timbre graph. - You can totally mimic someone's voice by moving the cursor to the edge of the table like in Fig 4.